When a state senator recently congratulated the CEO of a small, rural northern California hospital on the influx of insured patients expected next year because of the coming Medicaid expansion, he may not have anticipated the response. “It's not going to bring me any extra money, it's going to cost me more money in the long run,” Matt Rees of 22-bed Mayers Memorial Hospital District in Fall River Mills, Calif., says when recounting the conversation. The losses are expected from newly insured Medicaid patients seeking outpatient services, not emergency room services, which federal law already requires them to provide for free to uninsured residents. The financial hit stems from the Medicaid program reimbursing only 20% of the cost of such outpatient services, Rees says in an interview. Worries about low state Medicaid rates come as at least 25 states appear poised to undertake a historic broadening of their Medicaid programs' eligibility, according to health policy experts. That expansion—authorized by the Patient Protection and Affordable Care Act—is expected to send a surge of up to 10 million new beneficiaries into the program next year, according to recent projections from the Congressional Budget Office. State provider cuts during the recession and since have led to widespread concerns in California and elsewhere in the run-up to the Medicaid expansion that is the cornerstone of the federal healthcare overhaul, according to provider advocates. Many California providers are focused on a 10% cut to physicians and an effective 25% cut in hospitals' skilled-nursing bed payments. The cuts were enacted two years ago with HHS approval as part of state budget cuts. A federal appeals court is expected soon to decide their fate. The California cuts are significant enough to raise insolvency fears at some rural hospitals in the state. Eastern Plumas Health Care in Portola lacks the cash reserves to absorb the estimated $2.4 million cost of the retroactive Medicaid rate cuts, says Tom Hayes, CEO of the facility. And closure of the hospital and its four rural health clinics would eliminate the only Medicaid provider in a 50-mile radius. “It's very contradictory that while they are trying to expand Medicaid access, they are going to reduce access,” Hayes says. But California is not alone in aggressively cutting its Medicaid program's reimbursement in recent years as state tax revenue plummeted and the program's roles surged along with rising unemployment. States have consistently undertaken more cuts than increases to Medicaid providers since 2009, according to an October 2012 report by the Kaiser Commission on Medicaid and the Uninsured. 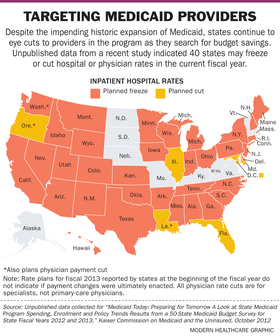 Some of the most aggressive Medicaid payment restrictions in the last fiscal year were among hospitals, which saw pay freezes in 23 states and rate cuts in 16 states. By comparison, nursing homes saw their rates frozen in 16 states and reduced in 12 states in the last fiscal year. But such institutional providers also were much more likely than other providers to have partially offsetting rate increases, thanks to built-in inflation adjustments and the use of provider taxes by nearly all states to draw down more federal funding for them, the report notes. Medicaid provider rates fluctuated with the economy as states look to offset drops in tax revenue, says Robin Rudowitz, one of the study's authors and an associate director for the Kaiser Commission on Medicaid and the Uninsured. And physician rates in those programs are among the most volatile. Such state Medicaid cuts have widened the gap between what Medicaid programs pay physicians, on average, and Medicare provider rates, according to a separate December 2012 study by Urban Institute researchers. That study surveyed states on changes in their Medicaid rates for physicians in recent years and found the average Medicaid physician rates were 72% of Medicare rates in 2008 and had dropped to 66% in 2012. Although many states undertook cuts in recent years, the widening gap was primarily attributable to Medicaid rates staying stagnant overall while Medicare rates rose somewhat during the same period, according to the report. No data is yet available on the effect of that widening gap, says Stephen Zuckerman, a health economist with the Urban Institute and an author of the study. But states that have lower rates tend to have lower provider participation in Medicaid. For instance, New Jersey has the lowest provider rates and one of the lowest physician-participation rates in the nation. “There's no question that higher rates correlate with higher participation,” Zuckerman says. A temporary boost in Medicaid physician pay for primary-care services in 2013 and 2014 as part of the federal healthcare overhaul is expected to provide brief relief and perhaps offset some recent state cuts, provider advocates say. But the knowledge that those increases expire in less than two years may deter the boost in physician participation that had been expected. The financial picture is even more complicated for institutional providers, such as hospitals and nursing homes, which tend to be more dependent on Medicaid than individual physicians and usually don't have the financial option of not participating in the program. For them, cuts to the program have to be offset by revenue from other sources, which also are expected to impose their own cuts. The combination of the state Medicaid cuts with a 2% Medicare provider cut that took effect March 1 under the sequester and health reform-mandated disproportionate-share hospital payment cuts beginning later this year are “potentially ruinous” to New York state hospitals, says Kenneth Raske, president of the Greater New York Hospital Association. And the pressure from reduced Medicaid spending is expected to increase, according to the Kaiser survey. In the current fiscal year, 42 states said they plan rate restrictions and only 37 plan increases for any providers. Such cuts would not come as a surprise to many providers, who note that Medicaid is the largest or second-largest item in every state budget. Medicaid “is a huge budget item, so I know that in the future they are going to be looking to cutting it more; that's where they are going to save money,” Rees says. The chances of further Medicaid cuts in the near future may have increased following the Obama administration's Feb. 25 filing in the California case that broadly supported state provider cuts. Although federal law generally requires that state Medicaid rates be sufficient enough to ensure some access to providers in each geographic area where beneficiaries live, the administration wrote that it was “entirely appropriate” for states to lower rates if they could still meet that obligation. Some health policy experts have described the court brief as a significant policy statement that gives the green light to states to enact further rate cuts even as the administration pushes them to undertake the historic expansion in the program's rolls. “You certainly can read it that way,” says Matt Salo, executive director of the National Association of Medicaid Directors.